The Farmall® Utility A series tractors will feature three new models — 55A, 65A and 75A ― all with a comfortable cab option. The Farmall Utility A series tractors are efficient all-around chore tractors perfect for any farm in any weather. A turbocharged, electronically controlled engine features 3 cylinders and a tunnel block design that ensures ruggedness and easy maintenance without sacrificing power, efficiency or performance. Six available models range from 53 to 75 hp (46 to 62 PTO hp)1. 1At rated engine speeds of 2700 RPM (50A, 60A and 70A) and 2300 RPM (55A, 65A, 75A). An electronic high-pressure common rail fuel system precisely meters fuel as power demands, delivering both performance and fuel efficiency. This fuel system also provides improved throttle response, fast recovery to load and quieter engine operation with less vibration. Engines use an Exhaust Gas Recirculation (EGR) system to meet Tier 4 B/Final requirements. Farmall Utility A tractors feature a simple, straightforward 8x8 mechanical transmission that’s easy to operate. Also available is a 12x12 power shuttle. This increases efficiency and is an especially valuable convenience when doing loader work. Creeper Transmission Option Copy: An optional creeper transmission can be added to the 12x12 transmission of Farmall Utility A tractors. This adds eight very slow forward speeds and eight very slow reverse speeds, providing a 20x20 transmission for operational speeds as slow as 6 feet per minute. The work is tough. The hours are long. Out here in the real world, operator comfort is no luxury — it’s a necessity. To help you stay productive day after day, Farmall Utility A series tractors offer a smooth ride with a comfortable seat, ergonomic, intuitive controls and a new spacious cab option to let any operator work all day, in any weather. Operator’s Platform: A large, open semi-straddle operator’s platform provides easy entrance and exit from either side. There’s no between-the-legs controls to get in your way, and the steel platform is stamped for proper grip while easily draining water and debris. Steer With Ease: Hydrostatic steering provides outstanding maneuverability — especially during loader work — and eases operator fatigue when making frequent headland turns in the hayfield or during other operations. Contoured Seat: A comfortable, contoured, fully adjustable seat fits each individual operator, making it easier to stay in the seat and see the day’s projects through to the finish. HVAC: Temperature control in new cabbed tractors provide additional comfort to make long days feel shorter. Factory-installed Loader Joystick: A loader turns your tractor into a versatile, powerful workhorse. To get the greatest productivity from your loader, it should be easy to operate. An optional factory-installed loader joystick integrates into the right-hand console. Easy Access: All controls and levers are within easy reach from the comfort of the operator seat. PTO engagement is located on the left side of the seat. Hydraulic remote levers and 3-point position controls are conveniently located on the right-hand side of the seat, as is the transmission shift lever. Easy to Use: Easy-to-use controls and automotive-style gauges make the Farmall Utility A series ideal for less-experienced operators. Hand and Foot Throttles: An important comfort factor often is simply the flexibility to choose what’s most comfortable for you or for the given task. Hand and foot throttles on the Farmall Utility A series let you pick. It’s this kind of flexibility that helps ease operator fatigue and shorten those long workdays. Room to Move: The large, obstacle-free operator’s platform provides excellent all-around visibility from the tractor seat, including rear visibility to the drawbar, PTO and 3-point hitch. Looking Ahead: The stylish, sloped hood on Farmall series tractors provides clear, unobstructed forward sightlines to the front wheels, loader and other front-mount attachments. Instrumentation: Well-placed controls and the instrumentation dash’s design provide easy access without inhibiting visibility. An automotive-style instrument cluster makes operation easy and familiar. Protection With Flexibility: A two-post ROPS provides protection without sacrificing visibility. The structure is foldable so you can complete tasks in low-overhead areas, and an optional sunshade canopy provides sun protection on long, hot days. 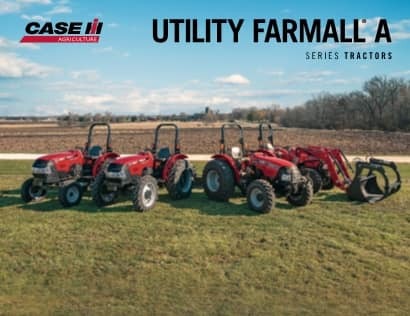 While the Farmall Utility A series gives you the workhorse you need at an excellent value, where these tractors truly shine is when you tap into our full suite of implements and attachments. To do that, you need reliable power and ease of use. And that’s exactly how we designed our tractors. A 540 rpm rear PTO comes standard. Or, choose a 540/540E PTO option for greater fuel efficiency during less-demanding applications. Flow Rate: A high-capacity hydraulic flow gives you the power you need for all kinds of heavy lifting, from loaders and backhoes to rear blades and rotary tillers. Remotes:Farmall Utility A series tractors include one or two standard rear remotes. Tractors with the factory-installed loader-ready option feature two mid-mount remotes. Color-coding: Color-coded hydraulic levers and couplers simplify hookup. Loader availabilities: Loaders available in mechanical self-leveling and nonself-leveling, with a range of attachment options from buckets to pallet forks to bale-handling equipment to meet any need. Heavy-duty 3-point: Telescopic stabilizers, along with available flex end lower links, simplify implement attachment. A single turnbuckle levels attachments. Mechanical positioning and an adjustable drop rate put you in complete control. Hitch lift capacities: Farmall Utility A tractors feature industry-leading rear hitch lift capacities. Extendable Drawbar: An extendable drawbar lets you customize towed implements to your desired position. Choice is good. 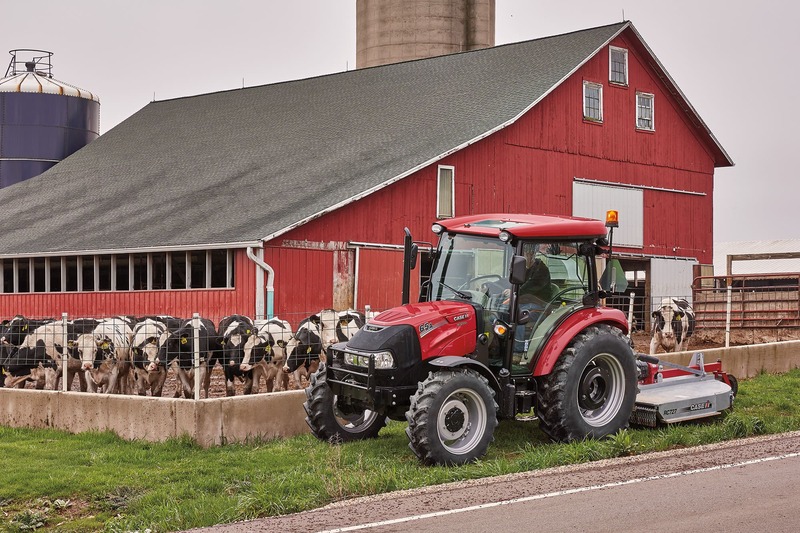 Whether cutting, putting up or hauling hay, cleaning cattle pens or moving snow and maintaining the farmstead, Farmall Utility A tractors deliver all the power and traction you need. Choose the best option — depending on the traction and maneuverability your operation demands. 2WD is ideal for lighter field work and maximum maneuverability. Go with MFD for improved traction and increased power to the ground. Farmall Utility A series tractors include fenders and handles for easy entry and exit. Farmall Utility A tractors let you get right to the task at hand without time lost on routine maintenance. After all, the sooner you get to work, the earlier you finish. A single-piece hood opens without tools. Gas struts support the hood when open for quick, easy access to engine components and checkpoints. Fueling is fast and easy with fuel-tank access from the ground or from the operator platform. Check and fill engine oil without opening the hood. A 600-hour oil-change interval reduces downtime and maximizes uptime. While Farmall Utility A tractors give you the versatile workhorse you need at a great value, our full suite of implements and attachments help you accomplish more, more efficiently. Case IH loaders are designed specifically for use with your Farmall Utility A tractor. These loaders feature structural strength and streamlined appearance. Integrated park stands and the quick connect system improve efficiency. The design of Case IH loaders lets you install and remove your loader in minutes. Your Case IH dealer offers a full line of attachments to help you get the most productivity from your Farmall Utility A series tractor. Implements are quick and easy to hook up and include disc mowers, wheel rakes, round and square balers, rotary tillers, backhoes and many others. This next-generation Farmall® Utility 50A has the specifications necessary to meet the demands of the task, without breaking your budget. Featuring a FPT 2.2L turbocharged and intercooled engine. The Farmall® Utility 60A is loaded with value for any operation. It delivers 60 engine HP and 51 PTO HP. Featuring 70 gross engine HP and 62 PTO HP, the Farmall® Utility 70A has what it takes to get the job done. The Farmall® Utility 65 A tractor delivers 64 engine horsepower at 2300 ERPM, providing both value and versatility. The strongest of the Farmall Utility A lineup with 74 engine horsepower at 2300 ERPM, this tractor can handle your tough jobs around the farmyard. Farmall tractors are perfect for turning to-dos into to-dones around the farm. 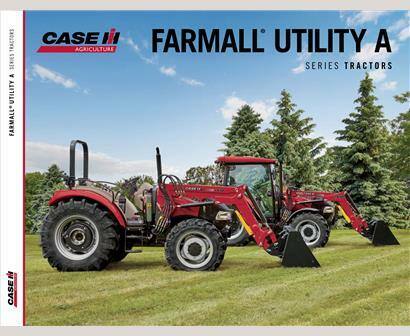 Click to read more about the the Farmall lineup on the Case IH blog.